I always needed test environment for my destructive experiments. Sandbox, if you want. A place I can do whatever I want without worrying about the consequences. I’m tired of destroying my operating system. I’m talking about these times when I modify and rebuild kernel modules/kernels/libraries for experimental purposes, such as making KVM support Mac OS X, making netfilter/iptables module support advanced connection tracking, etc. This time, I needed to patch rtl8178 kernel module (wireless driver) to allow packet injection. I decided to solve the problem once and for all. 1. Take snapshot, or “point in time” of the operating system and after experiment is finished return to that point. 2. Experiment in a “sandbox” where no one cares what gets ruined and it can’t harm the operating system. I prefer the second approach because when you roll back to certain point in time everything rolls back and I’m always doing more than one thing so I don’t want my other stuff to roll back as well. Besides, that kind of solution is always “heavy” as the whole system needs to be compared to the way it was before. Sure, you can make use of timestamps and more sophisticated comparisons to make it quicker but unless you use real snapshots (such as in LVM or ZFS), it’s not ideal. So we go with the sandbox approach. Once again we have a few options. We can create chroot jail but it might have problems accessing physical devices (I never tried actually) and I don’t really like the way the chrooted environment is created. We can use “live” operating system that runs directly from real memory (no changes are made to disk) but then only one operating system can run simultaneously which means that during the potentially destructive session my normal operating system won’t be available, which is exactly when I might need it. Virtual machine seems like an adequate solution. It fulfills the sandbox demand, it’s easy to setup and some virtualization platforms even got snapshot abilities. The only problem is it doesn’t always have access to physical devices. However, in this case the device is usb based and therefor accessible from within the virtual machine as well. For virtualization platform I chose VirtualBox (3.1.8). Vmware doesn’t support my processor’s virtualization capabilities so it’s out of the game and VirtualBox performs better than KVM, on my computer at least. Especially when it comes to I/O performance. Now I need to choose adequate operating system for the virtual environment. I want the operating system to be as minimal as possible, no need for fancy graphical environments, office suite, web browsers, etc… I started looking for candidates but man, there are so many distros out there! I would have simply used Ubuntu because I’m used to it, it has huge software repositories and it would be very similar to my actual operating system, the only problem is it comes with loads of unnecessary software. I considered installing Debian exactly for that reason and then I found out about Ubuntu’s JeOS (thanks Amir). JeOS stands for just enough operating system and it’s simply Ubuntu’s core. It seemed perfect for my needs. JeOS comes with Ubuntu server edition. The installation is fairly simple and quite fast. 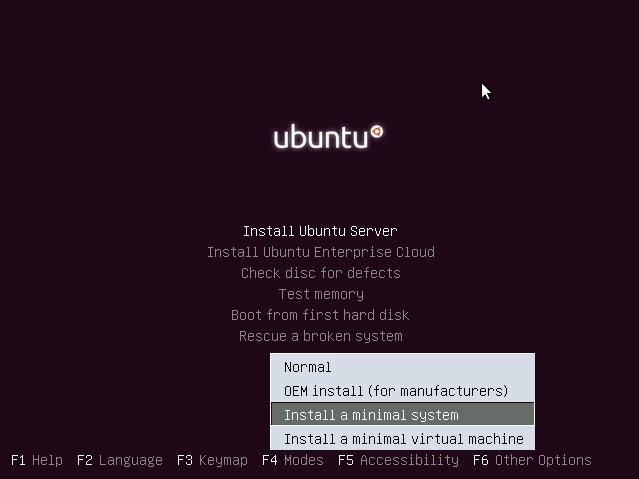 On the first installation screen you need to press F4 and select “Install a minimal system” as shown. There is also a Vmware/KVM optimizied version (“Install a minimal virtual machine”) but it’s not VirtualBox optimized so I chose the minimal server option. The rest of the installation is following simple screens. When I had the option to choose software packages I chose the basic Ubuntu Server and OpenSSH. That’s it. I also managed to recompile rtl8187 kernel module but it’s out of the scope of this post. Enjoy your new test environment!